I just got back from my pre-advanced birthday trip in Singapore and I can tell you that the happiest moment ever would be entering LUSH shop and shop till drop. That's also thanks to Eric for bringing me over here after I've told him I need to shop for Christmas gifts for my friends! 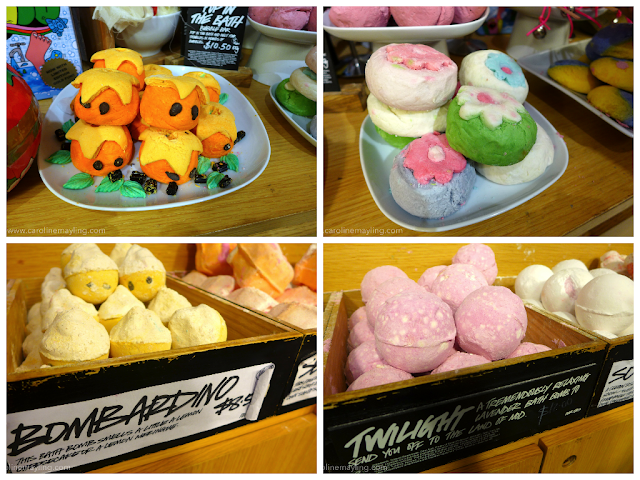 I just love and adore the Christmas items in LUSH! Upon entering the shop, I felt like being in what kind of heaven with such a wonderful scent! It smells so nice that I can just stay there for hours! 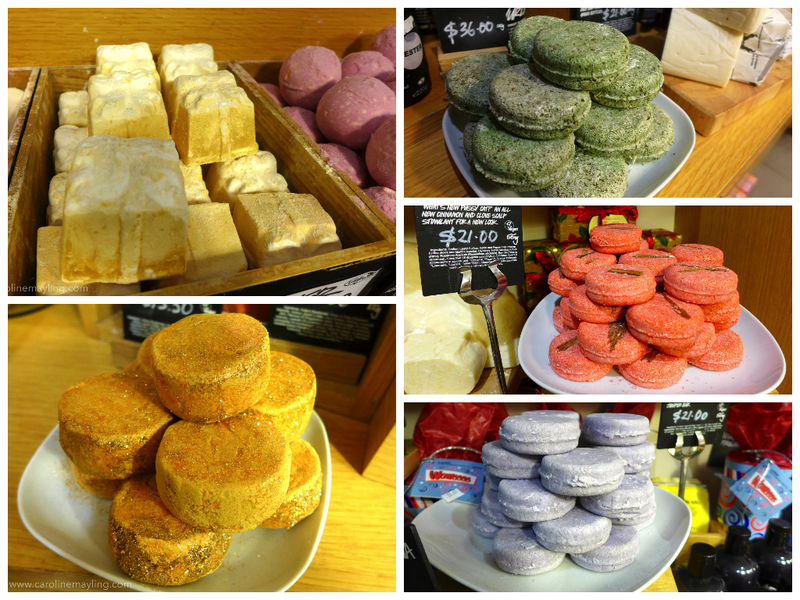 My most favorite section would be the bath bombs, bath melts and bubble bars. Everything looks so good and I wish to buy them all! Look what I bought as Christmas gifts for people I love, those who always there for me, brings me up when I was down; never failed to make me laugh out loud with their silliness and love me as much as I love them. Christmas is meant for a magical moment, at least to me. A magic wand always meant something for me - a wish come true. To give this Magic Wand Bubble to the few favorite persons of mine, who always be there for me, brings me up when I was down, always can make me laugh out loud with some silliness, I hope they are going to love it as much as I do. What so special with this reusable bubble bar? This star gives you mounds of sweet-smelling foam! Those who received this from me, please do enjoy your sweet bubble bath! Golden Wonder, with a gift-like look, totally caught my attention with its dazzling golden glitz! After all, Christmas is all about exchanging gifts! What so special with this bath bomb? Each layer has something different to offer. This is not for a quick bath because it takes its time. For those who receive this from me, you know you're special to me. I do believe in Santa Claus, I kid you not. This Father Christmas bath bomb is special in its way! It gives you all the colors and smells of Christmas, with mandarin oil and orange flower absolute. Drop a Father Christmas bath bomb into a hot bath and watch his white beardy face dissolves into a gentle pink fizz, then marvel as the bold green color of Christmas trees and traditional wrapping paper tints your bathwater, and the warm, citrusy scent of oranges rises on the steam. Those who receive this from me, I hope you do enjoy your Christmassy bath treat! I love White Christmas, hence the snow ball So White bath bomb here! So White has a crisp and delicate apple fragrance and will create a beautiful rose colored bath. After its white outer layer dissolves, the secret pink center will slowly fizz and bubble. Bicarb will soften our bathwater and the fresh apple fragrance will waft up through the steam helping you to feel calm and peaceful. Those who receive this from me, I know you're tense and I hope this helps to relax your tense at least for that bath hour. Joyful Christmas always filled with laughter and candies! Candy Mountain bubble bar has the fair trade vanilla absolute, sparkling snowflakes luster and creamy cornflour and bubble crumble mix that adds a magical pink mist to the peaks of foaming bubbles. Those who receive this from me, you know you're a sweet person to me and I want you to enjoy a sweet bath treat with this! What is Christmas without Snowman?! Snowman bath bomb dressed up in such jolly red scarf, contains cocoa butter that creates a moisturizing, creamy soft bath that is great for nourishing and protecting your skin. Those who receive this from me, I know beauty is something for you and why not enjoy something Christmassy too? Twilight bath bomb is way too special to me! It has the most beautiful fizz when it started to dissolve. Those who receive this from me, you must be another friend that I concern and I wish you to enjoy this relaxing bath treats and forget all the problem for once. To be able to travel to another space must be fun! I love that kind of adventure and hence the Space Girl bath bomb! Those who receive this from me, you must be something special to me! Please make sure you plunge your head underwater if you want to hear the full effect of the crackles and pops!